Gerri Viant’s love of adventure knows both external and internal landscapes. Whether backpacking around the world or exploring the vast interior of her feeling system and psyche, the joy of the journey permeates her. Viant, teaming with Sue Aery to win eight Womens Nationals and reach the finals of another two during a remarkable 13-year run from 1990-2002, knew travel was in her future. It wasn’t just that Viant loved to travel. It was the way she did it that says so much about her. Growing up in Adelaide, Australia there was a kind of cultural bias within her social sphere toward the big tour – of doing Europe, first by flying West to London and then fanning out across the Continent to begin a long trek that would bring the wanderer home. Arriving in Los Angeles, it didn’t take Viant long to acquaint herself with what would become her adopted country. As she remembers it, she may have been on her way to purchase a Greyhound Bus pass that would enable her to travel extensively throughout the U.S. Stopping to ask directions, she met a woman who responded to Viant’s cheerful independence and curiosity. Not only did Viant wind up with her bus pass, she also discovered a friend who introduced her to family members, college roommates and friends that housed her as she traveled for six months across the USA.“I trusted my gut,” says Viant. She continued on her path across the country and eventually reached the East coast where she stopped off to see her childhood tennis coach, Alan Lane. For Viant, when not occupied with maps and street plans, was also a gifted tennis player at an early age. Viant did pay enough attention to her game, though, becoming a top ranked junior player in South Australia. And she never gave up the sport or lost the skills she had acquired so early. 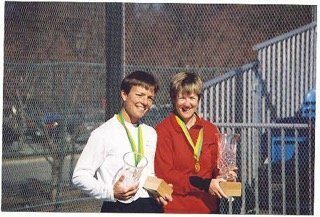 It was with Jones that Viant would reach her first Nationals finals (1987) and then win her first Nationals Championship (1988). It was also the only Nationals she won without Sue Aery whom she had known mostly as an opponent since 1981. There is every reason to believe that given the blend of talent, skill and psychological make- up, Viant and Aery could have extended their winning ways. However, Sue Aery made a decision that she wanted to go back to school in order to obtain a chiropractic degree. This arduous course of study coupled with a move to upstate New York meant she had to give up the kind of competitive paddle that would meet her standards. At the 2002 Nationals on Long Island, both Aery and Viant knew it would be the last under the regimen they had followed for so many years. It also presented the opportunity for them to win their third Nationals title in a row, a feat they had yet to accomplish. This match will always rank high, maybe the highest in Viant’s voluminous memory vault. But there was another match, one that she points to as critical to her development as a champion. It took a year for the partnership to become “unretired” as Aery and Viant paid a visit to the Nationals in 2004. Even with the lay-off and without the kind of preparation each was used to, the pair still reached the finals. “What’s changed is the influx of former WTA pros, NCAA players, and full-time platform tennis teaching pro’s entering the womens tour. The sheer athleticism and racquet skills are changing the way the game is being played today. Though her participation in highly competitive tournament play may have waned, there were other outlets for her copious energies. 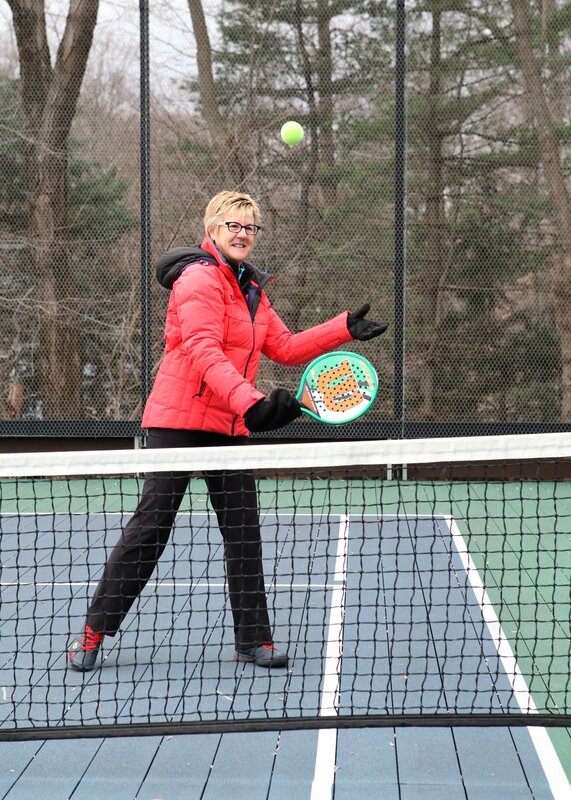 She continued to teach and run the tennis and paddle tennis programs at the Nyack Field Club. She also became fully engaged in the teaching and promotion of paddle at multiple levels through a traveling platform tennis camp. “It was Sue Aery’s idea,” says Viant. Aery had started Gold Medal Paddle Camps with Mary Ginnard. 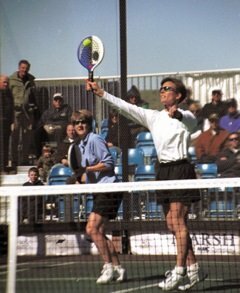 A year or so later in 1999 she and Viant combined to form Performance Paddle Camps. 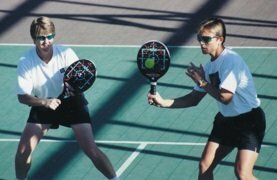 The two of them did the camps the first year and then brought in Mike Gillespie, with whom Viant had won the Mixed Doubles Nationals in 1989. Performance Paddle Camps is still going strong and as such is a testament to Viant’s love of the game and the delight she takes in seeing it grow. The sincere, effective almost joyous kind of teamwork that helped create the camp off the court serves as a model for the skill, strategy, and tactics that are taught on it. 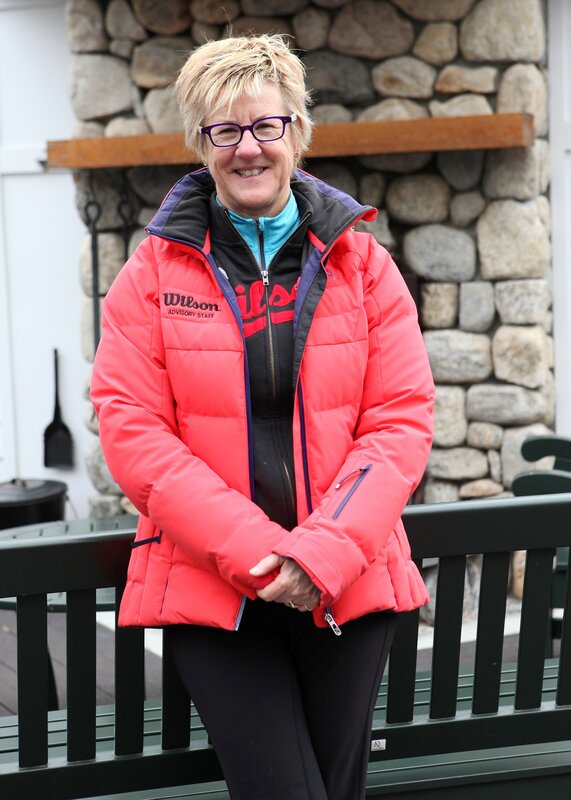 While she just this year retired from her position at the Nyack Field Club after 32 years of sterling service, Viant may find herself busier than ever even though her time now is supposed to be her own. She will also do instructional videos and comment on major tournaments via live stream. The role of commentator suits her well. “You want to comment as if you were playing the match. I want people to really see what I see.” Her continuing success as a platform tennis teacher, especially when it comes to the mental aspects of the game helps her immeasurably. Her commentary on the South Shore finals was fresh, thoughtful, enlightening and dynamic – never inserting herself, never giving the feeling that she wanted to. She is completely, happily immersed in the sport that she loves. The talk will often be about Gerri Viant and her methodical, relentless preparation; about how she and Sue Aery would study tapes of their opposition, work out in the gym, drill and practice, eat the right foods. But what she also brings to the table is an understanding of people, particularly those who don’t, haven’t, or can’t do it her way. And she makes those people feel good because she knows many if not most can love the game as much as anybody else. Because she is profoundly a people person, Gerri Viant works with what people can do, not what they can’t. In doing so, she advances the good of the game, which is what she is all about in the first place.